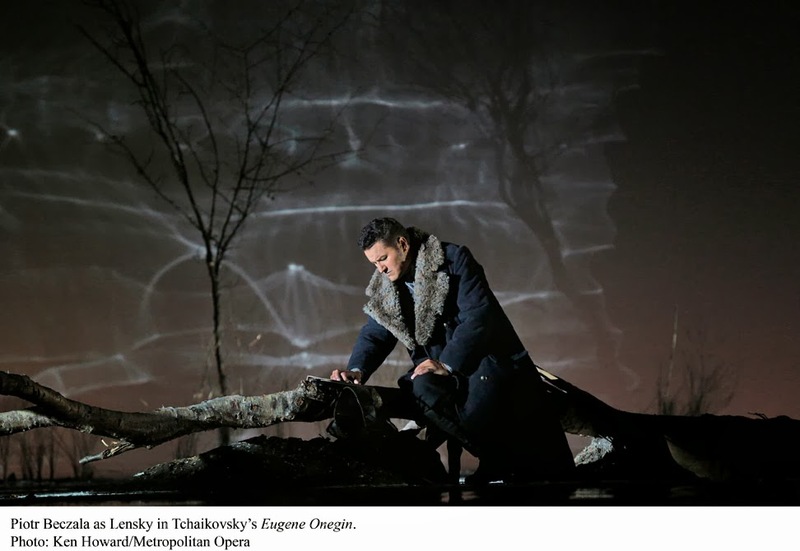 I spent the early evening watching the Deborah Warner/Fiona Shaw production of Tchaikovsky's Eugene Onegin filmed at the Metropolitan Opera this past fall. For the most part I enjoyed the production, though a few things I found unnecessarily challenging, and downright in the way of otherwise excellent story telling. First up was the lack of a bedroom for Tatyana's all night vigil and the opera's most famous scene. Another problem was the duel . . . I know I'm not the only person who found rifles instead of pistols just an overall bad idea. Other than several other similarly odd choices. the production worked well, and the development of its characters and their dramatic choices/direction from the singers throughout was fascinating and frequently moving. Onegin made clear his desire not to kill his best friend, when Lensky extended his hand before the duel and Onegin grabbed and hugged him, only to be rebuffed and pushed away in order to get on with the business of death. In sinking to the ground and cradling his dead friend in his arms, we immediately sense that Onegin will be forever haunted by this unnecessary, preventable tragedy. 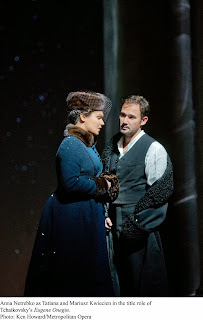 I'm not the greatest fan of Anna Netrebko, but Tatyana turns out to be an ideal role for her vocally and histrionically. She struck several nicely juvenile poses in her first meetings with Onegin. Nebs's Tatyana seemed a tad distant during her Name Day celebration but her development into the Princess Gremin nicely balanced a newfound maturity with a bit of the passionate girl still left in her. Mariusz Kwiecien offered a terrifically nuanced and theatrically compelling Onegin. If not as plush or warm of voice as Hynninen, Allen, Hvorotsovsky and other great interpreters of Tchaikovsky's ennui-ridden antihero, his was a more complex and frequently more likable Eugene than we frequently get, adding to Tatyana's dilemmas both early on and at the end. 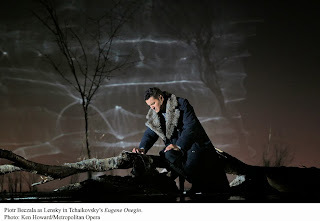 Piotr Beczala's Lensky was a bit too sunny of character making his jealous outrage and violent treatment of Olga in Act 2 seem like that of a man unhinged, a light in which I've never previously considered seeing Lensky in. Nonetheless his singing throughout, and in the duel scene particularly, was exemplary, nuanced, passionate and, ultimately, heartbreaking. Oksana Volkova, Elena Zaremba, John Graham-Hall and most of all, Larissa Diadkova, sang well, each having invested their characters with the kind of "lived in" naturalness that aids immeasurably to the storytelling. As Prince Gremin, Alexei Tanovitski produced some of the strangest singing I can recall; a throbbing sound with an oddly coiled vibrato, the tone itself was not entirely unpleasant, but the result was too odd for these ears not to notice. I'm divided on the final kiss offered by Tatyana to the astonished Onegin before leaving him to crumple to the ground, hopeless, desolate . . . but no longer bored. I very much liked staging this scene outside in a nighttime winter landscape, the falling snow bestowing a chilly beauty to the almost overheated proceedings. Valery Gergiev had things well in hand in what must have been his umpteenth performance of the Russian potboiler. Never once sounding routine Gergiev pulled out all the stops for those big, glorious Tchaikovskian climaxes which, even though coming through a home sound system, got my blood pumping just the way I always expect them to. Minessota Opera's Powerful "Silent Night"
NBC's Sound of Music: Live! Yikes! Alagna and Alfano's "Cyrano": Panache!